Did you know that chia seeds can serve as an antidepressant? Or that they can help protect against cancer, keep you looking and feeling younger, and help you lose weight? The chia plant is a relative of the mint plant. It makes tiny, flavorless, gluten-free seeds that are chock-full of antioxidants and fiber, and when combined with water, they can be used as a replacement for butter or oil in your favorite baked goods. In addition, the plants contain an oil that naturally repels pests, making it easy for farmers to grow the seeds organically, without the use of pesticides. If that’s not enough to convince you to try them, consider that chia seeds help balance blood sugar, help prevent diseases such as diverticulitis and diverticulosis, and contain the essential fatty acid omega-3, which lowers hypertension and benefits your heart. You’ll be amazed to learn all the ways chia seeds can improve your physical and mental health. With this book, you’ll also learn how to incorporate chia seeds into your diet, with tips and recipes for baked goods, entrées, desserts, and more. 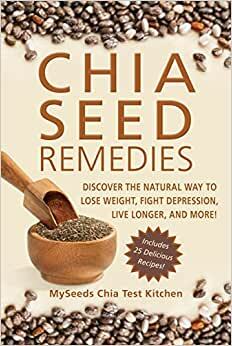 Written in an easily accessible style, but backed up with charts, true stories, and well-researched facts, Chia Seed Remedies just might change your life. Myseeds Chia TestKitchen is dedicated to promoting the incredible health benefits of chia seeds. Their website www.mychiaseeds.com, offers a wealth of information and sells the highest quality mixed black and white chia seeds. They are based in Dania Beach, Florida. Really great easy read on chia seeds. Great explanations on the seed's attributes and how to use the seeds or gel in your existing recipes. Good explanation section on how chia gel can be used in substituting for egg or oil. Great recipes are also included. Book is recommended. This did explain what the chia is and how to use it...I just thought it would contain more recipes. I will get the cookbook later. This is the most amazing little book. I learned so much about good nutrition as well as the wonderful recipes inside for making all kinds of tasty things to eat. Chia is truly a remarkable seed. It seems to have everything we need to stay healthy. A complete protein too!!! I highly recommend buying this book. I just started using Chia seeds so far it has met my expectations. I can't taste them in my smoothies.